A six-wicket haul from the left-arm spinner Dharmendrasinh Jadeja sealed Saurashtra's 62-run victory against Haryana in Rajkot. Saurashtra began the day well-placed at 162 for 3, with their half-centurions Sheldon Jackson and Jaydev Shah still at the crease. However, Jaydev's wicket in the 48th over triggered a slide which saw the team lose their last seven wickets for just 47 runs, with Jayant Yadav running through the tail on his way to picking up 6 for 90, increasing his match tally to 13. It meant that Saurashtra were bowled out for 213, and Haryana needed 226 for the win. The team, however, failed to get going in their chase, as no batsman was able to raise a much-needed fifty. Kamlesh Makvana (3 for 48) rattled Haryan's top order, before Jadeja wrecked the rest of the line-up with figures of 6 for 63, as Haryana were bundled out for 163 inside 45 overs. The defeat would have especially hurt for Jayant, whose all-round efforts in the game went in vain. In addition to ending with a haul of 13 for 154, Jayant was also Haryana's top scorer in both innings, hitting 97 and 35. Shalabh Shrivastava's second century of the season lifted Vidarbha to a promising position against Gujarat going into the final day in Surat. At stumps, Vidarbha were 307 for 8, with a healthy lead of 295. Having already conceded a first-innings lead, Vidarbha began the day at 39 for 1. They rode on an 81-run partnership between Ravi Jangid (39) and Shrivastava after Faiz Fazal had given the team a solid foundation by compiling 75. Jangid fell in the 75th over, but Shrivastava added a further 53 runs for the next two wickets to take the team close to the 300-run mark. 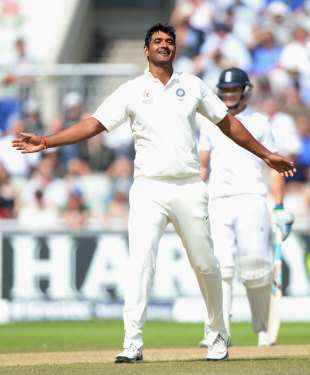 Shrivastava stroked nine fours to make 101, but was trapped lbw towards the end of the day. Just like in the first innings, Ramesh Powar was the pick of Gujarat's bowlers, collecting 5 for 99 to take his match tally to 10. Rajasthan needed less than 60 overs to complete a 10-wicket win against Odisha in Balangir. Odisha were 144 for 9 coming into the penultimate day, and Deepak Chahar (4 for 30) needed just two deliveries to collect the final wicket. With a lead of 161 runs in hand, Rajasthan duly enforced the follow-on. Odisha once again faltered in their second innings, as the fast-bowling pair of Pankaj Singh (3 for 50) and Tanveer-Ul-Haq (4 for 29) ran through the team for 199 inside 53 overs. An 82-run stand between Anurag Sarangi (56) and Pratik Das (45) gave the team some respite, but no other batsman was able to make more than 22. It meant Rajasthan needed just 39 for the win, and the team hunted down that paltry total in 6.4 overs, thanks to a 20 from Robin Bist and a 21 from Pranay Sharma.